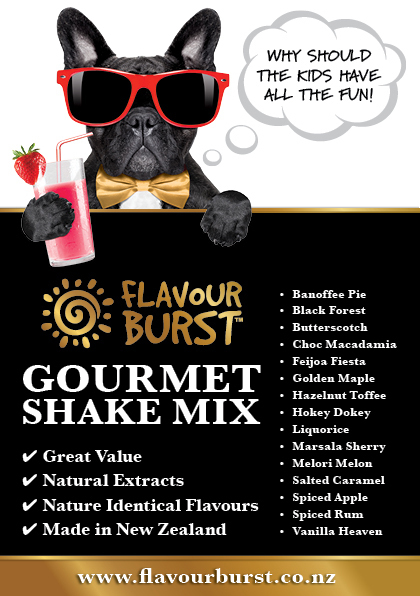 Flavour Burst is a great tasting range made in NZ to suit local tastes there’s milkshakes (Gourmet and Traditional), non alcoholic mockshake mixes, topping syrups, use over icecream, pancakes and yoghurt, slushies and iceblock mixes, colours and essences. This range will continue to develop as required. With unique flavours such as Banoffee Pie, Chocolate Macadamia and Salted Caramel to name a few, you will want to be first to stock these new and exciting flavours that your customers will remember. They are all great tasting, great value and offer great margins. 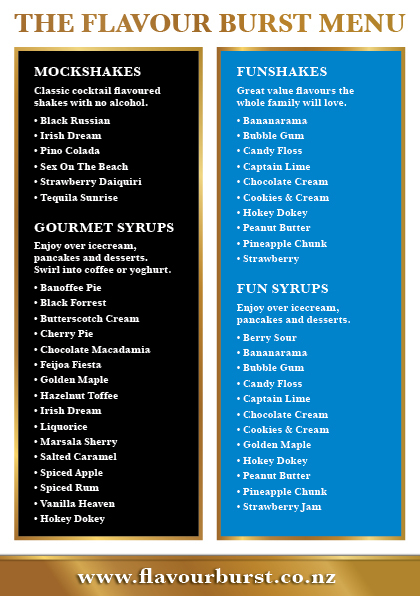 There are traditional and low sugar options available. All are gluten free and are made with high quality ingredients that result in a great tasting product. All products are produced in allergen free premises. With nature identical flavours and approved colours and Made in New Zealand to ANZ Food Safety Authority standards. Promotional flyers, posters and brochures are available. Remember to also ‘like’ our Facebook page – that way you will keep updated with new recipe ideas, competitions, new products and giveaways. No Login? Contact us for an application form. Sign up to receive special deals, recipes and news.